I love the Montessori approach and my kids love hands-on learning. What I don’t love is hunting down all those materials and then watching my budget dwindle. I can also admit that I sometimes am not quite sure what to do with all the fun materials once I collect them-I must lack creativity because I quickly run out of ideas. Therefore, I was excited to have the chance to review an all-inclusive Montessori kit from Brainy Kit. Brainy Kit offers a monthly subscription service called Brainy Box. This is an all-inclusive kit of Montessori materials for children ages 3-6. The box is delivered to your door on a monthly basis and each kit is a different theme. Each box comes with a set of lesson plans that contains activity ideas and instructions for using the items in the box. The program was developed by Viktoria Altman who started Brainy Academy which is a Montessori-based school in New York. She then decided to bring the Montessori approach to more families and introduced the Brainy Box. This kit allows families to integrate Montessori learning into their homes without the burden of purchasing the expensive materials or even being educated in the Montessori philosophy themselves. We received the box of materials for the polar unit. 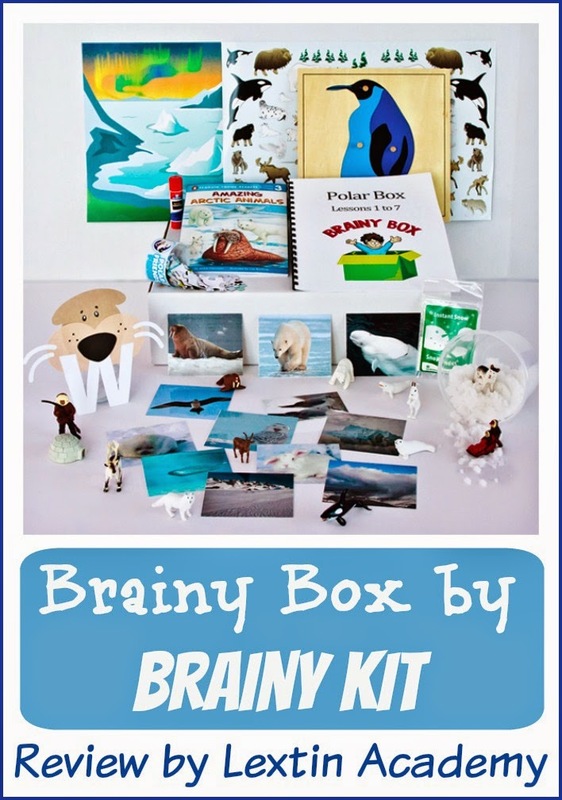 This box included a 24-piece puzzle, animal figurines, a wooden puzzle, a glue stick, a walrus face to glue together, a large paper with a polar background and animal stickers, a glue stick, insta-snow, a book about polar animals, and laminated cards of animals, winter clothes, and the north and south poles. I took some time to read over the lesson plans to get a feel for the program. The plans include 7 lessons but there are several activities in each lesson so I felt it would be easy to do a lesson over more than 1 day. I recruited by two older girls (ages 9 and almost 6) to help me teach the younger girls (ages 4 and 2). I gave them a couple ideas from the lesson plan and supervised while we all explored the materials. We usually only spent 20 minutes on the activities for the day (because we have a full school day planned each day). But I found it easy to do a partial lesson each day and fill our 20 minutes of preschool time with ideas from the box. And there were some days when we simply repeated many of the activities from the previous days. We tried to get to the activities 3 days per week. My favorite part of the program was the lesson plans. I don’t feel I’m super creative and usually I’m just tired after our long days of homeschooling and the additional housework on top of schooling time. I worry that I don’t spend enough time preparing a preschool program for my younger kids and I don’t have the energy to plan lots of things for them to do and then purchase all the supplies. So, I appreciated that the program was planned for me and came with numerous ideas on how to use each item in the box. Some of our favorite activities were playing with the insta-snow, matching the animal cards to the animal figurines, reading the book and discussing the animals (with questions from the lesson plans), and creating a scene with polar animals with the stickers. I enjoyed that my older kids could take part in the activities as well as help teach them to the younger ones. I found that the kit was something we could do together as a circle time. However, it allowed me to specifically focus on my younger kids and encourage them as they explored. I appreciated that everything we needed to complete the activities was included in the kit and the lessons encouraged my kids to explore the items in many different ways while sparking a stimulating discussion about what they were discovering. This program is Montessori for everyone and I found it a fun and simple way to integrate preschool hands-on learning into our busy homeschool days. You can subscribe for $39.95 per month.